Will Smith averages one blockbuster per year. This time he's teamed with his son who is a chip off the old block(buster). Brace yourself! Scriptwriter Guillermo del Toro takes us to our planet 1,000 years after humans had to evacuate. Directed by M Night Shyamalan, this PG-13 thriller tells us that "Danger is Real, Fear is a Choice." I'm not sure how I feel about THAT, but it proves to be a key factor in the survival of our two intrepid travelers. The critters who are the most deadly, can smell fear; if you can control your fear you become invisible to them. 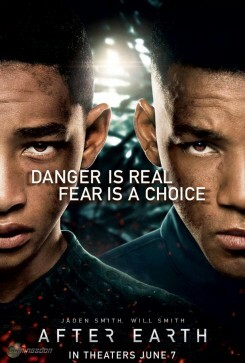 * Will Smith ("Hancock"), who commands a space ship that crash lands on a deserted planet. Desperately hurt, he must depend on his son to reach the tail section of the space ship, which had broken off during the crash. The beacon to summon help is in that debris. * Jaden Smith ("Karate Kid" 2010 ) is a young cadet (he wants to be a Ranger like his dad) who is tasked with a tough overland trek through dangerous territory, nasty beasts, and hostile weather. Oh, and a dwindling reserve of supplies. He is frantic with fear. * Sophie Okonedo (Lots of BBC TV) is their lovely wife and mother; her sweetness and wisdom plays perfectly here. * Zoë Kravitz ("X-Men: First Class") and yes, she's Lenny's daughter. Here she is daughter and sister to our heroes. She absolutely looks like a member of that family! This is basically a two-man show that is targeted for an audience that likes action, scary beasts and edge-of-the-seat thrills; the females are here to provide motivation. In my opinion, it scores a resounding bullseye!